With the black cocked hat, the neckband and the narrow jacket, this boy looks older at first than he really is. His curly hair is bound to a braid as it was fashionable at his time, the Rococo period. 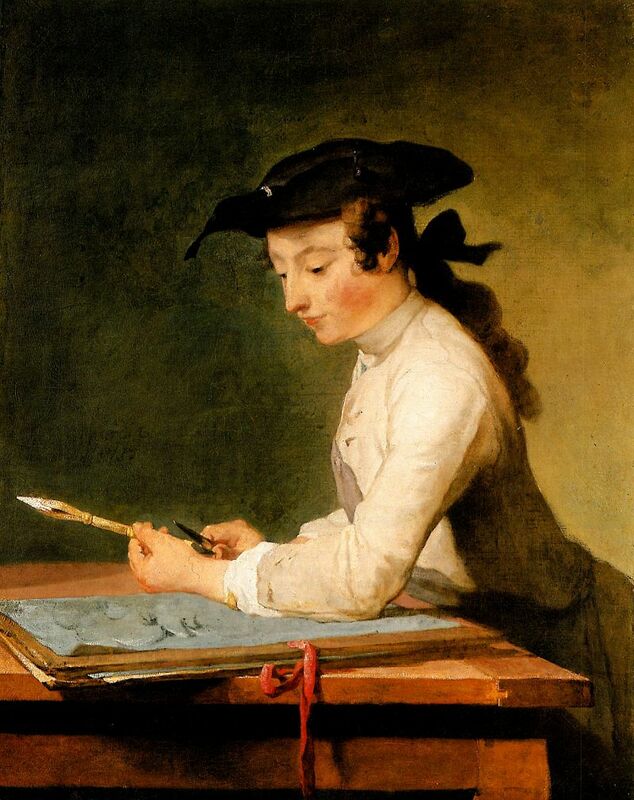 J.B. Chardin had painted various portraits of children in Paris in the style of the Berlin boy, e.g. a boy building a card house (National Gallery London) or the one who lets his roundabaout spin (Louvre, Paris) - all similar to the drawing boy in regard to clothes and attitude. The boy is leaning on his large drawing map und sharpens his chalk, and he gazes upon the unfinished drawing which shows the head of an old man. A symbolic content lies within this image. The opposites of the old man and the youth are descriptive in this case, illustrating the opposites of re-creating versus nature, of art versus life. The learning boy preparing his utensils is in the process of transformation from pupil to artist. This is a theme often found in the 18th century: the boy on his way to adulthood, the young artist on his difficult road to perfection.